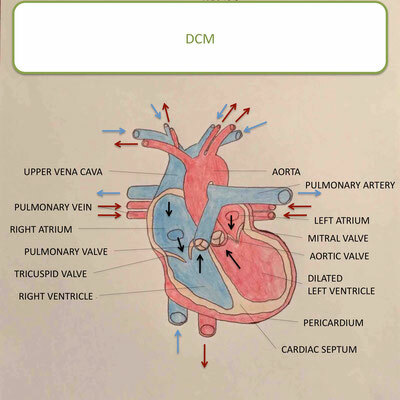 DCM - What is it? 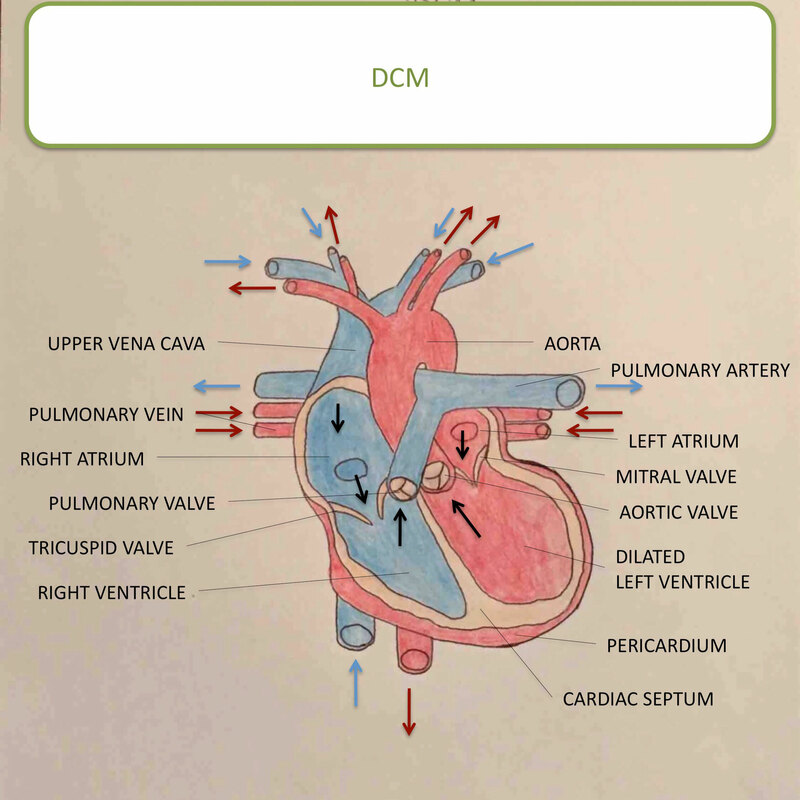 Dilatative cardiomyopathy (DCM) is a myocardial disease that manifests itself in a pumping weakness of the heart muscle. Due to the resulting under-supply of the body circulation with blood a low blood pressure results. The body tries to increase the blood volume by means of fluid resorption in the kidneys and dilating the blood vessels with different neurohormonal compensatory mechanisms. First this sounds good and also causes the blood pressure to rise. However, the heart cannot cope with the increased load caused by the higher blood volume. In addition, the heart must now pump the blood against a higher resistance due to the constricted blood vessels. 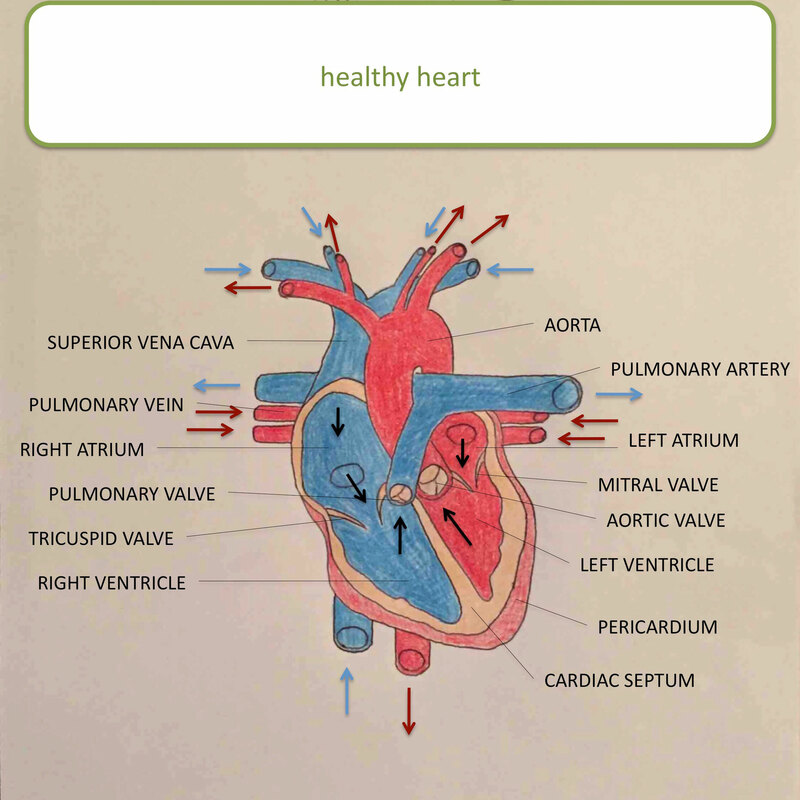 As a result, the heart muscle increases its muscle mass, resulting in dilatation - the heart's muscles grow apart, the main chambers are enlarged and the heart is additionally damaged. In the further development, the body is no longer optimally perfused in the front, while "backward" causes congestion and thus oedema (eg pulmonary oedema) or occasional effusions (eg ascites or pericardial effusions).Often cardiac arrhythmias occur during the course of this disease, which in some cases may also result in sudden cardiac death. Depending on the time of their occurrence, one speaks of DCM in a juvenile form (<1 year) or in adult form (2-6 years). In addition, the DCM runs in two phases that follow one another. The course of the disease begins with the subclinical (also occult or hidden) phase, which runs unnoticed and without symptoms. Only in the subsequent clinical phase symptoms show such as cough, weakness of performance and fainting. The possibility that a dog is completely unnoticed in DCM, because he is still in the subclinical phase, once again shows the importance of preventive cardiac ultrasound. Which forms of DCM do exist? The primary DCM can be idiopathic (= with unknown trigger) or genetic. Once a disease occurs more often within a particular breed or within a family, a genetic cause can be assumed. In a 1999 study with dogs in the US, the Labrador Retriever was in position 12 of the DCM affected breeds. At this time the figures for Germany could not be confirmed, but according to Dr. Kresken, this has changed in recent years. Of the Labrador Retrievers involved in DCM, approximately 80% are male animals.